I’m glad he views this as the only snag. He’s 87, has sciatica and a heart problem and has recently damaged his toe, making it difficult to walk. 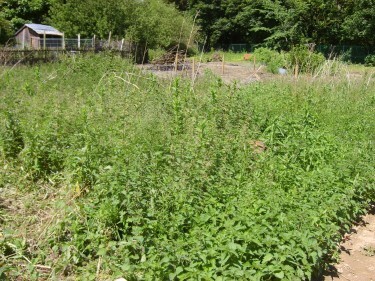 The plot is at the back of a well established allotment community. We walk the maze of narrow paths, passing impressive examples of old-fashioned recycling: ancient ceramic baths planted full of potatoes, old windows made into mini greenhouses, peeling doors standing, leaning and lying, for no apparent reason at all. 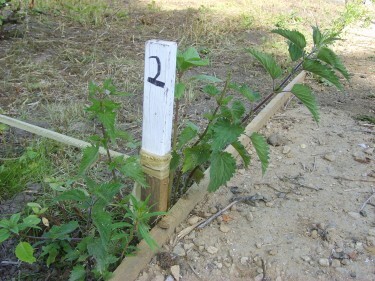 Slowly because of Dad’s difficulty on the uneven ground, we reach our plot. I stare at what looks like an acre of nettles and Himalayan balsam, chest high. Faced with reality, Dad will decide to turn the offer down. Surely. He stands, teetering slightly. I am sure the beauty of the spot is linked less in his mind to the river and trees nearby and more to the fact it isn’t going to cost him a penny. We walk back down the little green ginnels to the car, past all the well-established allotments, the ones where you can actually see soil. Chickens cluck and point their heads at us. Cockerels crow, geese squawk and goats stand silently chewing. ‘Is this something you really want to do, Dad?’ I ask. Now’s the time to make my position clear. I have neither the time nor inclination to take on a project like this. The only vegetables I recognise in the sea of neat crops stretching as far as the eye can see are the potatoes. My other half isn’t that keen on the idea so we can’t count on him for much help. But I say nothing. Instead, for some reason I find myself turning to my Dad and smiling. ‘It IS a beautiful spot,’ I say. Let me be the first to comment! Love it. Story, diary, documentary and family archive all in one place. Brilliant. Bet you really enjoyed writing it (is that why you’re up so late?) Love the cliff-hanger, and the glimpse of characters. What will you carpet-bomb the allotment with? Weed-killer? Or carpet? Here’s to the start of your new story. Don’t lose the balsam, I hear it’s a cure all kind of thing. Could be worth it just for that! Ah yes. If I had realised you were so gullible I’d have roped you in on mine. Then you would have had a genuine excuse to turn down your Dad. And everything would be all right…. No. Seriously. Nettles? Friar’s balsam? Ha! Pcha! I could tell you things about perennial weeds that’d make your hair curl. Well done! Hours of…. fun…. ahead of you. And ahead of your readers. A fab project in every sense. God Bless This Patch and everyone up to their neck in it. Thanks a million for visiting my blog and for your comments, everyone! I’ve SO enjoyed reading them. 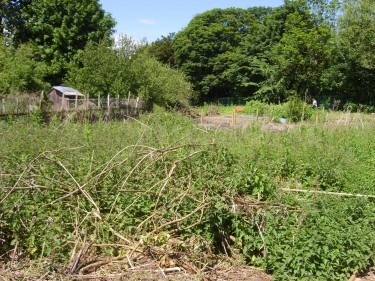 Makes the work ahead on the allotment seem almost do-able… hmm. Eyes down for another installment next week. Well done, daughter! The work is the beauty of it. The time you spend with your father there will be priceless. Ours used to look like that. I remember it fondly; life was so easy in those days. All we had to do was dig and despair of ever growing anything. Now,the bloody place is productive, and you wouldn’t believe the work! Cropping, composting, freezing, jamming, pickling, buying another freezer…..enjoy! I look forward to hearing about it all. Loved this! Can’t wait to see how the story unfolds! Beautifully written,as always. p.s. lovely piece of writing, Mandy. Will Mandy and her dad experience a garden Renaissance? Will there be poems among the potatoes? Had I known (as someone said) I’d be happy to share my 1/3 acre site with you. Once you start getting the Freaky Flier Miles it’s practically… free. Later, I’ve got to go see if the snow is off yet. Mand–i’m soooo taken with this!! I tend to agree with Lemar…strange things grow deep on an allotment-and i’m not talking about stuff you can cook! Its a wonderful idea and although the old back may, at times, say different i can’t imagine that any other part of your being would have regret…. I await the next phase enthusiastically! Thankyou for sharing this with me-it has re-kindled a warmth for overgrown, earthy places…. Noos, Now I understand. Can’t wait to hear about the plowing under. You and your dad in overalls, muggy heat on your skin. I’m gonna want a potato sent all the way to Montana. Hi love! What a fab snippet to keep me awake while breastfreding baba (thank the goddess for iPhones!). So good to get some Yorkshire humour and gritty values in sunny castlemaine (Victoria), although tis raining as i write. Must share experience of recent trip to allotments in Melbourne. Very neat and tidy! Each gardener has a raised bed 8 foot square and wood chip pathways all round. An alluminium shed houses tools and watering cans. They appealed to my tidy Virgo mind but they lacked wildness and looked v inorganic! Give me your plot any day…without the rain! A Gardener friend recently boasted about being ‘productive’ in November (April in English) and I glanced inthe direction of his five children and remarked that he seemed to be productive all year round! He didn’t appreciate my wit which is why I feel the need to repeat it!! So good to read your stuff darl. Lovely website Mandy. Beautiful to think you and your dad may have a project together. Ok, sounds like you might just have to do most of the work but a place where you can both share the beauty of nature all around and each other. Love the blog and the poems, Mandy – esp the sonnet. You are so good! Fabulous – hours of fun coming up. All that digging…you’ll turn into the female Seamus Heaney. Thanks for letting me know about this, it’s great. I love to hear other people talk about gardening and enjoy watching the beauty they reveal. I’ll happily follow your blog, just don’t ask me to do the work! Lovely human story but more to the point I’ve got my name down for an allotment and last time I enquired the cow at the council offices said I hope you’re still alive when your turn comes up – well given my state of mind you can imagine how well that went down!!!! Enjoyed reading that. How lucky to have your Dad.Get a shed for hiding in. What else can I read that you have written? Jack is hoping to come to Leeds in Sept to do chemistry. I really enjoyed this and it speaks a lot about the relationship with your dad. Can’t wait to hear how the story unfolds and the nurturing of veg, dad and the soil. My father and stepmother nearly divorced when he ‘helped’ weed her cherished allotment in Oxford and pulled up all the flourishing asparagus…. loved pared down story & the inevitable (but not anticipated) punch line…many echoes for me with my dad. The optimism of age absolutely inspiring! VEGETABLESSS!!!! Me wanna allotment, preferably on the top of a campervan though! 🙂 Hope all goes to ‘plan’. You know where I am if there’s some manhandling of machinery to be done. Or just remedial tasks, I don’t mind. Happy to help. I’m good with a fork! PS. Apologies for my grammatical and spelling naughtiness. Must make your skin crawl. You could borrow someone’s slowly deflating ‘Kiss me I’m forty’ birthday helium balloon and tie it to a wooden post by the essence-of-raspberry-bush-in-the-ethers-awaiting-birth, as a bird-scarer. You could learn to speak hedgehog and squirrel and rat and teach that wonderful dog that ‘allotment’ means ‘seeking out old bones’ then watch the fun. You could employ a hunky young Mr. Rotivator and start a new exercise class for the neighbours. The possibilities are endless…..
Lovely! And publishable too, I reckon. Work with your owld Dad while you can, lass. we want more. We want more. We want more! Great fun to read. How’s it going so far? My idea would be Landshare – give loads of people some land and profit from all their chickens, potatoes and so on as well as a great social life. I hope your Dad gets his blackcurrants. Very heart warming. Lovely story – keep it going. Whats the EASIEST way to pick blackcurrants please? Thanks once again, all, for your comments. Emma, love the asparagus story. John, re blackcurrants, my Dad just breaks the whole stem off, which is undoubtedly the easiest way, though you do then have to contend with some green ‘uns and it’s wasteful if you haven’t got that many blackcurrants to start with. I am more picky, but it takes me AGES. Our bushes have turned out to be mainly redcurrants, which seem a lot easier to pick as you can just comb them off with your fingers and leave the stem intact. What do you do? Di, landshare sounds a wonderful idea. I’ll work on it! Good for your dad and good for you too. May I humbly suggest that if and as you reclaim bit by bit of the land you may want to plant some courgettes. Any fool, and by any fool I mean me, can grow courgettes. 4 plants will keep your county in courgettes for hte summer and even if the weeds overcome you (they do us every summer) and the carrots never appear (impossible damn vegetable) you will feel and share the success that is courgettes. Hi Mark, LOL about supplying the entire county! Really appreciate your advice, and love courgettes so will give it a try. Have you tried slicing them thinly and grilling them drizzled with olive oil and covered in parmesan cheese shavings? Mmmm…. My Dad gardened till he died at 91, Mandy and i never tired of going all the way from Bristol to central Scotland to discuss gardening with him. he had acid soil and I have alkaline and envied his azaleas and heathers while he envied my earlier spring – by a month. i am now 82 and my daughter has the same conditions as her grand-father in Northern Ireland. Your father sounds like he had a very thrifty upbringing. When I worked in Hull I found the Yorkshire people every bit as thrifty as the Scots. But do not count the cost of your fresh veg, you WILL grow in money but rather in taste, achievement, friendships and precious words f wisdom from your father. Thank you, Marion. YOUR words of wisdom are much appreciated. Mandy, you have to say yes ! You know you can never have too many blackcurrants !! Too right, Jane! The statement ‘you can never have too many blackcurrants’ is even better than ‘you can never be too rich or too thin’.